The New Jersey State Museum is located at 205 West State Street in Trenton, New Jersey, United States, overlooking the Delaware River. The Museum is operated as part of the New Jersey Department of State. General admission is free. The Museum's main collection of specimens, artifacts and objects dates back to items collected in the early 19th century. The Museum also includes a 150-seat planetarium and a 380-seat auditorium. The New Jersey State Museum serves a broad region between New York and Philadelphia. The Museum asks for a 'suggested' admission of just $5 per person. However, because the admission fee is 'suggested,' and programs are free or offered at a very low-cost, the Museum is accessible to visitors with low- to moderate incomes. The New Jersey State Museum was the first state museum in the country established with education as a primary focus of its mission. The New Jersey Legislature formally established the Museum by law in 1895; the Museum received re-accreditation from the American Alliance of Museums in August 2003. As put forth in the mission statement: The New Jersey State Museum serves the lifelong educational needs of residents and visitors through its collections, exhibitions, programs, publications, and scholarship in science, history, archaeology, and the arts. Within a broad context, the Museum explores the natural and cultural diversity of New Jersey, past and present. In its beginning, like many museums of its era, the Museum focused on natural history. The first major collections were of rocks, minerals and fossils from the New Jersey Geological Survey, which began in 1836. In 1912, the Museum expanded its focus to include archaeology through an acquisition of artifacts produced by Native Americans in the region. These artifacts dated from the prehistoric and historic periods as well as from New Jersey's diverse populations during the Colonial and post-colonial eras. 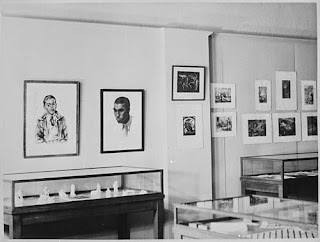 In 1922, the Museum was one of the first on the east coast to exhibit, as art, a collection of North American Indian objects. With the acquisition of these objects, the Museum started its ethnographic collections. In 1924, decorative arts were added to the Museum with examples from the Trenton-area ceramics industry. 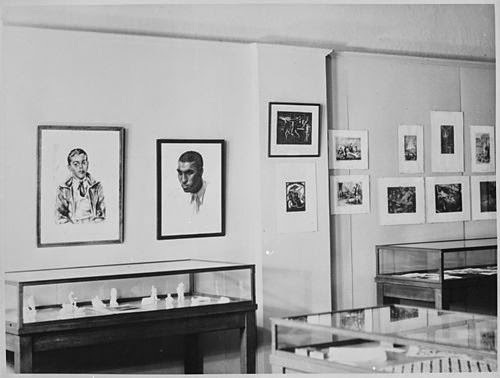 And while fine art had been exhibited and acquired through the mid-20th century, the Museum began a strong collecting emphasis on paintings, sculpture and works on paper in the early 1960s. In 1964, the Museum moved from the State Capitol complex into the newly created Capitol Cultural Complex. The Main Building, now a classic example of modernist architecture, consists of four floors of exhibition space, a 150-seat Planetarium and public spaces including a Gift Shop. A second building holds a 384-seat Auditorium as well as gallery spaces. Additionally, the Museumâs Civil War Flag Gallery, which exhibits the Museumâs Civil War flag collection on a rotating basis, is located at 225 West State Street. The Bureau of Archaeology/Ethnography collections encompass approximately 2,400,000 prehistoric and historic specimens acquired by nearly 100 years of excavation, as well as more than 4,000 ethnographic objects acquired as gifts to the Museum. Scholars widely recognize the Museumâs archaeology specimens as the definitive systematic research collection for the study of the prehistory of New Jersey. Important sub-sets include the archaeological collections from both the Abbott Farm National Historic Landmark Site and the Delaware Water Gap National Recreation Area. The Museumâs archaeology collections are respected as one of the most important collections for the regional study of northeastern North America, and provide data on the entire span of human occupation in New Jersey from prehistoric times to the 19th century. The ethnographic collection consists of specimens that represent the Lenape and other North American Indian groups, and also include a small number of West African specimens collected to interpret the heritage of New Jersey's African-American population. Additionally, the collection also consists of a small grouping of Asian objects collected by New Jersey donors while they were on business or pleasure trips during the late 19th century through the 1950s. In a move toward reinterpreting the African and Asian works, these objects are now being presented as examples of cultural objects from people who have moved to New Jersey from around the globe. The Bureau of Cultural History preserves and interprets historical objects that document the lives of people who have lived in New Jersey from the 17th century to the present. The collection includes over 13,000 artifacts documenting New Jerseyâs cultural, economic, military, political, and social history, as well as aspects of its decorative arts. Ranging from ceramics produced by Trenton potteries to decorative quilts made and used by New Jersey women to utilitarian artifacts reflecting the rich maritime and agricultural heritage of the Garden State, the Cultural History Collection is one of the largest material culture collections dealing with New Jersey history. Textiles, trade tools, furniture, and an array of artifacts documenting craft, work, play, community, and family life are also represented in the collection. The Cultural History Bureau also oversees the preservation and interpretation of the NJ State Capitolâs collection of military flags used by New Jersey regiments in the Civil War and World War I. The State Museum has collected over 12,000 works of art including paintings, prints, drawings, sculpture and photographs, most acquired since 1965 when the Museum's mission was expanded to include fine art. The collection has an American focus that highlights the work of New Jersey artists within the context of American art history. Also included are works that depict New Jersey scenes and events. The strengths of the Fine Art collection lie in works by the American modernists associated with Alfred Stieglitz, American abstract artists of the 1930s and 1940s, a comprehensive collection of works by 19th and 20th-century African-American artists, contemporary American and New Jersey art, the complete graphic outputs of Ben Shahn and Jacob Landau and works by the New Jersey Fellows associated with the Brodsky Center for Innovative Editions/Rutgers University. American Perspectives: The Fine Art Collection is on view on the second floor. The Bureau of Natural History holds a diverse collection of about 250,000 specimens which have historic and cultural significance, in addition to their scientific value. The natural history collections are especially strong in industrial minerals and ores, paleontology specimens (fossils), osteology specimens (bones), modern shells, and a systematic study skin component. Smaller sub-collections include pinned insects, fluid-preserved fauna, taxidermy mounts and glass lantern slides. The Museum displays an early reconstruction of the first nearly-complete dinosaur ever excavated; Hadrosaurus foulkii (affectionately known as âHaddyâ among school children) which was found in Haddonfield, New Jersey in 1858. The bureau is also the repository for about 300 type (first documented) specimens of Paleozoic and Mesozoic fossils, as well as a large number of fossils documenting the Paleozoic strata within the Delaware Water Gap National Recreation Area. Minerals from the zinc-mining locality of Franklin-Sterling Hill are well represented, including the largest number of fluorescent mineral species in the world, as are mine-specific specimens from New Jerseyâs industrial iron mining past. Specimens from beyond New Jersey are used for comparative purposes in exhibitions and educational programming, to augment the systematic collections, and for research purposes. The Museum's replica of a Hadrosaurus â" a specimen unearthed in Haddonfield in 1858 that was selected as the state's official dinosaur in 1991 â" was the target of a renovation project in the late 1990s to correct a display that had been on exhibit since the 1930s. The replica's original skull, a model created as a substitute because the actual skull was not preserved, was to be replaced with the narrower skull of another duck-billed dinosaur. The Museumâs Bureau of Education offers programs or events designed to offer activities that not only engage our audiences but help to instill a desire for lifelong object-based learning. School groups may attend auditorium-style performances and Museum-based classes, as well as access classroom resources such as curriculum guides and object loans. Teachersâ workshops offer opportunities for classroom teachers to gain additional knowledge and skills which they may employ back in their own classrooms. General audiences can participate in a variety of performances, lectures, gallery walks, demonstrations, film series, scout programs and more. The 150-seat Planetarium features a Minolta MS-10 instrument for sky shows and visual displays of the solar system. Exhibits include displays of constellations, solar system models and space exploration.